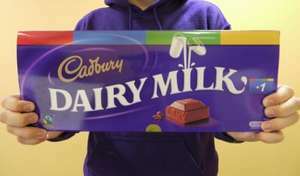 Back in stock for delivery to store, extra large novelty bar of 1kg Dairy Milk. Posted this deal a few days ago but was expired due to being oos. Purchased a bar last year and it lasted from Xmas to New Year. So you ate roughly 200g a day, well done you ! It's 1 whole bar, maybe you can fit the whole thing in your mouth?????? Shared between 5 family members and a sneaky chocolate thief! Buy 3 for £6 and you would get 1080g. ASDA is doing 360g dairy milk at £2.... Buy 3 for £6 and you would get 1 … ASDA is doing 360g dairy milk at £2.... Buy 3 for £6 and you would get 1080g. not same impact for gift .. So, like almost everything else, these 400g bars are now down in size by 10%, but not the price. I hate sneaky price rises. I can do better .....! Asda are doing 390g Galaxy Bars (much better tasting chocolate, imho) at £2 each. £6 for 1170g!!! You guys are kidding, right? It's the size of this one, single bar that's the novelty! It's not about making a saving. It's just a cool Christmas present for a kid or something. I boycott Cadbury/Kraft ever since they sacked the British workers and moved production to Poland. Lovingly made in Poland by Krafty Foods, Inc.
Edit: I forgot, Kraft has changed its name to Mondelēz now. Which makes their food [sarcasm] so much more appetising [/sarcasm]. How annoying.. just brought one yesterday from superdrug for £6.99! I boycott Cadbury/Kraft ever since they sacked the British workers and … I boycott Cadbury/Kraft ever since they sacked the British workers and moved production to Poland. Yet you have no qualms using a myriad of other products made abroad that could be made in the UK? What's xenophobic about taking a stance at a company that took over a British institution and SACKED the British workers? Last time I checked, this was still a democracy. And the chocolate that is parading as "Cadbury's" nowadays tastes NOTHING like the stuff that was previously made here. Yet you have no qualms using a myriad of other products made abroad that … Yet you have no qualms using a myriad of other products made abroad that could be made in the UK? You don't know me. I'll leave it at that. What's xenophobic about taking a stance at a company that took over a … What's xenophobic about taking a stance at a company that took over a British institution and SACKED the British workers? Last time I checked, this was still a democracy. And the chocolate that is parading as "Cadbury's" nowadays tastes NOTHING like the stuff that was previously made here. It's not parading as Cadburys, it IS Cadburys. Tastes pretty much the same to me (I had no idea it was now made in Poland), and as their continuing sales will show, it will to most other people as well. Nor do I need to know you. I know for a fact you use goods from abroad when you could be using British goods. Galaxy is ALWAYS too creamy, doesn't even really taste of chocolate. Although I am agreeing with people here, I've recently bought a big bar of Dairy Milk (360g YES I was very peeved) I am actually agreeing with people here, they have changed it. It does not taste as nice as it used to, not even close. I don't even really enjoy eating it anymore. I won't boycott them because it'll do nothing, but i certainly will never buy a bar at full price ever again. I know for a fact you use goods from abroad when you could be using … I know for a fact you use goods from abroad when you could be using British goods. You don't know anything about me. Or about the goods I use. I don't need to know anything about you to know for a fact you use goods from abroad. Damn, think I've missed it! Dairy Milk?Should be called Dairylea Plastic Flavoured ChocolateLovingly … Dairy Milk?Should be called Dairylea Plastic Flavoured ChocolateLovingly made in Poland by Krafty Foods, Inc.
Actually I'm pretty certain actual Dairy Milk bars are still made in Bourneville, other Cadburys products had production moved abroad. Still available, can a mod un-expire please? Tbh, I think it was more of the promise to keep the factory open and how they handled the rest of the situation. Not boycotting because I love the hot chocolate but certainly don't buy the bars. The taste is different maybe it's just me.